With more than 1 million copies in print, the Practice Makes Perfect series is the world's go-to resource for learning and mastering languages. If you are an intermediate speaker of English, but want to brush up on your conversation skills, this updated 2rd edition will help you practice your English using the most effective tools available-including new audio exercises you can access FREE via app or online. 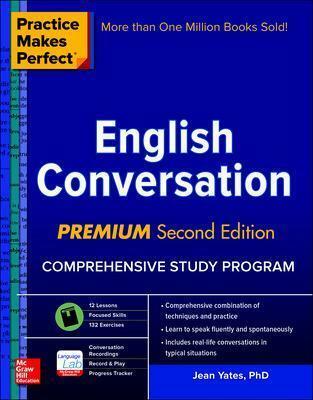 This premium edition provides a wide range of common phrases, sample sentences, and interactive dialogues that will help you identify the important "markers" in everyday conversations and situations. You can practice your skills using audio exercises you can access on the app or online. In no time at all, you'll be speaking English fluently, engaging in conversations easily, and expressing yourself with confidence.